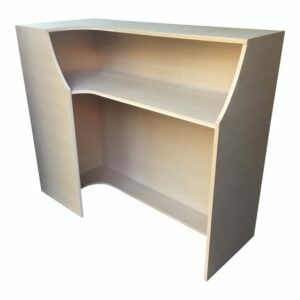 Item Number: 255 Overall Measurements 1200mm High x 1200mm Wide x 750mm deep (at it's deepest) Desk height 900mm Includes: Rounded edges Cupboard Can add lock for £12 extra Can create any size you require Note price doesn't include computer cable hole or lock. However both can be added for £12 each. We can create these at any size you require or feel free to send us a quick sketch of a unit you would like and we can quote you. Message us with your area/ postcode for a delivery quote. 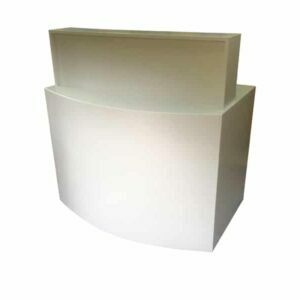 Item Number 232 Overall Dimensions 1400mm wide x 1170mm high x 510mm deep x 600mm on outside L return. Note price doesn't include the front detail like in photo 5, however this can be added as an extra. We can create these at any size you require or feel free to send us a quick sketch of a unit you would like and we can quote you. Message us with your area/ postcode for a delivery quote. 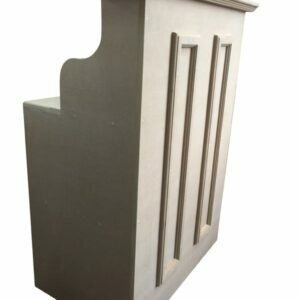 Item Number 342 Overall Dimensions 800mm wide x 1200mm high x 510mm deep Reception desk built in shabby chic style with a double thickness hand finished top with hand made MDF moulded front detail. We can create these at any size you require or feel free to send us a quick sketch of a unit you would like and we can quote you. Message us with your area/ postcode for a delivery quote. 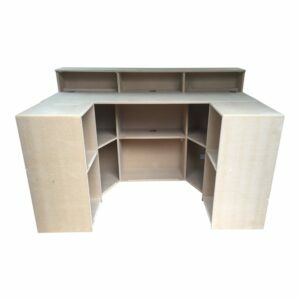 Item Number 234 This combination includes the following: 3 Units measuring 900mm high x 600mm deep x 1000mm wide. 1 Unit (corner) measuring 900mm high x 600mm deep We can make these from Oak, Maple, Beech, Cherry, Walnut high quality veneered board. 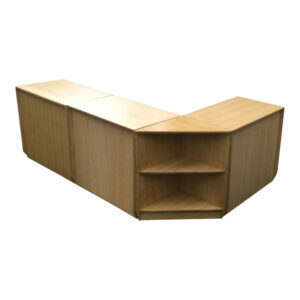 Made from high quality real wood veneered oak MDF with real wood veneered 2mm edge banding. Note pictures show the veneer finished in a hard wearing clear lacquer. This can be adding for +95. We can create these at any size you require or feel free to send us a quick sketch of a unit you would like and we can quote you. Message us with your area/ postcode for a delivery quote. Item Number 228 This combination includes the following: Unit 1 H 1100mm x D 600mm x W 1700mm Unit 2,3 H 900mm x D 400mm x W 400mm We can create these at any size you require or feel free to send us a quick sketch of a unit you would like and we can quote you. Message us with your area/ postcode for a delivery quote. 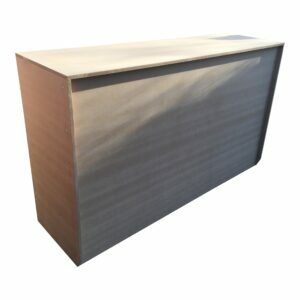 Item Number 224 900mm High x 600mm deep x 600mm wide We can make any size you require. More shelves available Message us with your area/ postcode for a delivery quote. Item Number 339 This combination includes the following: Unit 1 H 1100mm x D 500mm x W 1000mm Unit 2 H 1100mm x D 500mm x W 1000mm Unit 3 H 1100mm x D 500mm x W 1000mm Unit 4 H 1100mm x D 500mm x W 1000mm Extras available: Sliding rear doors, drawers, more shelves, can make any size you require. We can also make these from laminate or paint them in any colour. Message us with your area/ postcode for a delivery quote. Item Number 211 Unit 1 H 1200mm x D 600mm x W 1800mm We can create these at any size you require or feel free to send us a quick sketch of a unit you would like and we can quote you. Message us with your area/ postcode for a delivery quote.